Baburen, Dirck van (b. c. 1595, Utrecht; d. 1624, Utrecht). Dutch painter of religious works, history pieces and genre scenes, a leading member of the Utrecht school. After studying painting in Utrecht with Paulus Moreelse, a portraitist and history painter, he traveled (c. 1612) to Rome, where his style became strongly influenced by the work of the Italian painter Caravaggio, whose dramatic contrasts between light and dark he found particularly fascinating. His most important Italian commission was the decoration of a chapel in the Church of San Pietro in Montorio, Rome (1615-20), which included his Entombment (1617). He carried out this commission together with his friend and colleague David de Haen. In 1620 Baburen returned to Utrecht, where he shared a studio with Hendrick Ter Brugghen in about 1622-23. Although he died in 1624, he played a leading role, with Honthorst and Ter Brugghen, in establishing Utrecht as a stronghold of the Caravaggesque style. 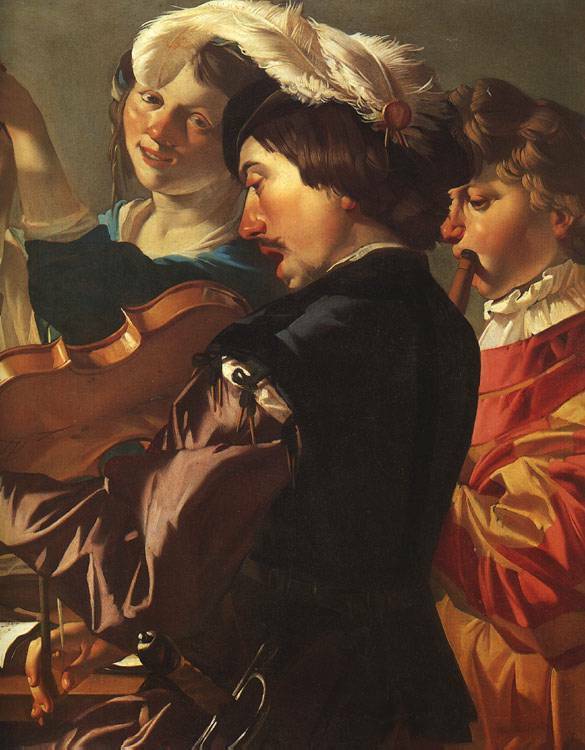 The Utrecht artists adopted Caravaggio's chiaroscuro and realism. As Caravaggio, who often painted ordinary labourers, they chose models with weather-beaten faces and often portrayed them larger than life and dramatically lit from one side. The influence of Caravaggio may be seen in his Christ Crowned with Thorns (two versions, at the Franciscan House, Weert, Netherlands, and at Drury-Lowe Collection, Locko Park, England), based on a lost painting by the master. 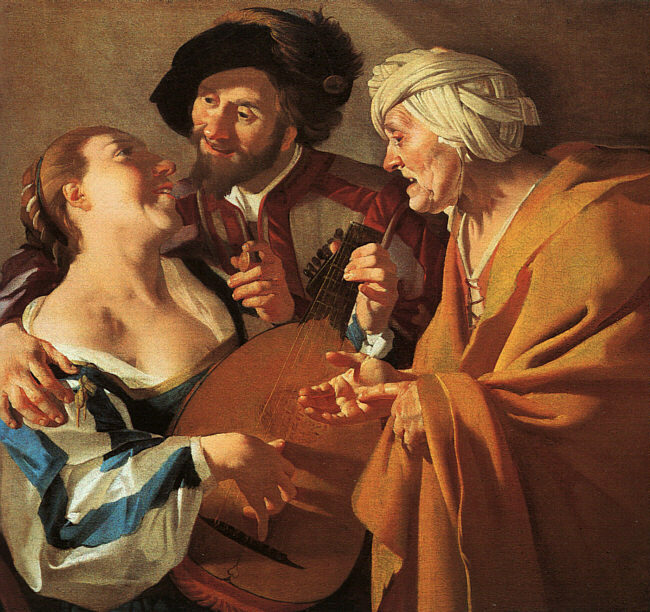 Baburen was especially fond of genre scenes (subjects from everyday life), such as his best-known work, The Procuress (1622; Museum of Fine Arts, Boston). This picture is seen in the background of two paintings by Vermeer, whose mother-in-law apparently owned it. A certain coarseness in conception, irregular compositional rhythms, and less atmospheric quality distinguish Baburen's art from that of his greater contemporaries, but his manner of painting can be said to be broad and forceful. The city of Utrecht was the center of Catholic life in the otherwise Protestant Dutch republic, and Baburen was one of a group of Utrecht painters who, unlike most of their Dutch contemporaries, had studied in Catholic Rome. Influenced by the Italian master Caravaggio, these artists specialized in painting large, half-length figures, brought close to the picture surface and solidly modeled in strongly contrasting light and shadow. In this spirited image of mercenary love, an amorous client bargains with a procuress (one who solicits clients for a prostitute) for the favors of a voluptuous young woman. The figures' colorful costumes suggest street entertainers or characters in a play. A lute, symbol of love, occupies the center of the composition and the gestures of the hands that surround it tell the painting's story. Though he painted mainly religious subjects, Baburen also created scenes of ordinary life on occasion. His Procuress of 1622 was sufficiently admired fifty years later that the great Dutch master, Vermeer, included it in the background of several of his pictures. Clair-obscur (French) and chiaroscuro (Italian) both mean 'light-dark'. The two terms are used to denote sharp contrasts of light and dark in paintings, drawings and prints. Although the effect was already in use before, the term came into vogue in the late 16th century. The word originates in Italy. The painter Caravaggio (1573-1610) made chiaroscuro his trademark. He was a master at painting dark scenes illuminated by a single ray of light.